Plastic products at a French restaurant in 2016. CNN noted that the plastic reuse rate is frankly embarrassing compared to other products: While just 14 percent of all plastic used globally is collected for recycling, the rate for paper is 58 percent and the rate for iron and steel is around 90 percent. Scientists have concluded that the Great Pacific Garbage Patch, an area of the ocean where huge amounts of discarded plastic items eventually end up, has now grown to at least 87,000 tons of marine wildlife-killing waste. 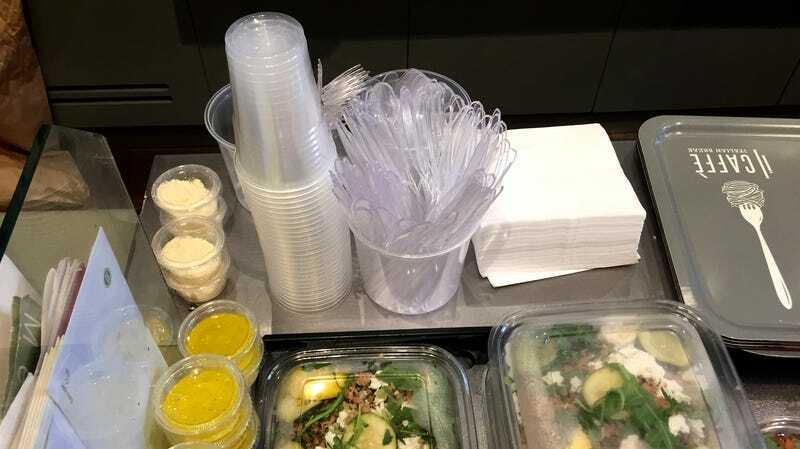 The ban doesn’t mean that consumers in the EU will suddenly be unable to get these items; instead, products like plastic forks and knives with “readily available alternatives” would be replaced with products made from more environmentally friendly materials like bioplastics, per Reuters. The UK, which is (maybe) scheduled to leave the EU around the time the plan could reasonably be given the green light in May 2019, is already considering similar rules. Stateside, the movement against cheap, disposable plastic items has not yet found anywhere near the same level of success. California voters enacted a first-of-its-kind ban on plastic bags in 2016, resulting in a precipitous drop of 72 percent in the amount of such waste found by litter collectors by the next year, and a number of other cities and localities have done the same. But a number of other states have resorted to reactionary tactics favored by manufacturers and restaurant industry groups, making it illegal for local governments to do so.